With three cats and three dogs, this is a product we use all the time. The aroma is refreshing and not sickly sweet. Easy to use, and the nozzle doesn’t become clogged. Will be continuing to buy it. I love this carpet spray. It keeps the bedroom smelling fresh and clean after vaccuming. I like the even distribution of foam and the wide angle nozzle. I have only recently discovered no vac and am loving it so far! I spray carpets and lounges every 2 – 3 days for a full freshen up! 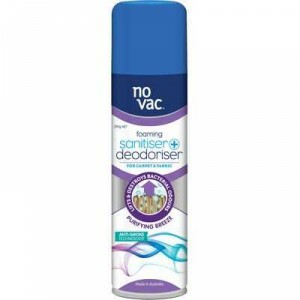 How would you rate No Vac Sanitiser & Deodoriser Carpet Purifying Breeze?